Blake Shelton and new "Voice" coach Usher. 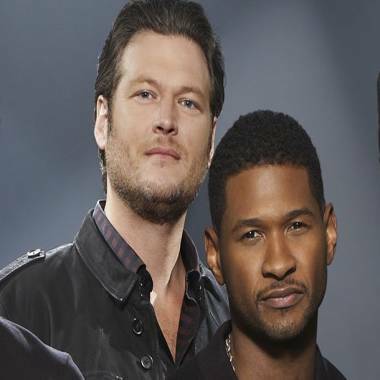 Blake Shelton says he’s not going to BS – “The Voice” is going to be different when it comes back Monday night. Gone are fellow coaches Cee Lo Green and Christina Aguilera. Their revolving red thrones will now be occupied by one-name wonders Shakira and Usher. “It’s different with different personalities and a different chemistry,” Shelton shared at NBC's party at the TV Critic's winter press tour. Right away, he knew Usher would be a fierce competitor. The country superstar knew a lot about Usher, but less about Shakira before the show started. The pre-voting shows have already been recorded, and although Shelton has won the last two battles with his team representative, he said he often gets shut down when he and other judges turn for the same contestant – and have to woo the singer to their respective teams. Not that it was so easy with Shakira, though. But does he engage in a little nose rubbing when it comes to his past wins? “I don’t mention it unless I’m around Adam, knowing how competitive he is and what a baby he can be,” Shelton said with an impish grin. For fans eager to watch how well the new judges mesh with the vets, there will be a spectacular joint performance. How do you think the new group of coaches will do this season? Tell us on our Facebook page!